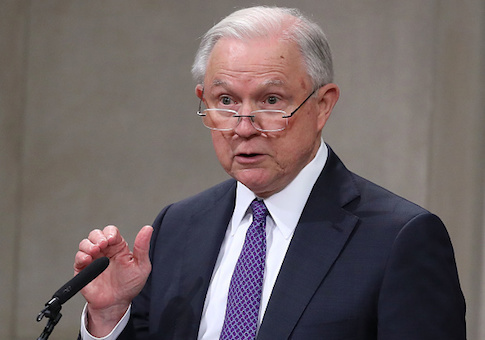 The Justice Department will also establish an Appalachian regional prescription opioid strike force, Sessions said, which will be responsible for targeting doctors illicitly prescribing opioid painkillers for profit as part of so-called pill mills. Sessions's announcement came as a part of his opening remarks at the DOJ's first National Opioid Summit, a convocation of law-enforcement leaders and activists to assess the current state of the opioid crisis. As Sessions noted, the most recent figures from the Center for Disease Control indicate that some 72,000 people died from drug overdoses in 2017, the highest rate in almost 40 years. Sessions contended that total overdose deaths fell slightly between September 2017 and February of 2018, indicating that the crisis might be abating thanks to on-going policy efforts. "These are preliminary numbers—and we want much bigger decreases—but these numbers give us good reason to hope. We are on the right path," he said. To push further down that path, Sessions outlined four new initiatives to support law enforcement combatting the drug crisis. DOJ will provide a combined 35 million dollars to support law enforcement efforts to combat drug trafficking in the states most affected by the crisis. About three quarters of that money will go to fund 17 state task forces as part of DOJ's Anti-Heroin Task Force program. Another 7.2 million dollars are earmarked for combatting surging methamphetamine deaths. As the Washington Free Beacon previously reported, meth overdoses have exploded in recent years, thanks to huge quantities of industrially manufactured meth being smuggled over the southwestern border. A further 34 million dollars will be distributed to the Office for Victims of Crime, which will in turn support children who have been victimized by the opioid crisis. "These funds will support things like counseling, mentoring, foster care, legal services, and training for school personnel and law enforcement," Sessions said. "The Trump administration is investing a lot more than $34 million in treatment and assistance to those in need through HHS—but this is our latest step." Beyond distributing money, however, DOJ will expand the manpower available to combat the crisis by creating the new pill-mill task force. Appalachia is home to the highest overdose rates in the United States. As the Free Beacon has previously reported, much of the opioid abuse in the region, especially Kentucky, can be traced to pill mills in Detroit. The summit came as part of a spate of actions by the federal government to help combat the drug crisis. On Wednesday, President Donald Trump signed the bi-partisan SUPPORT Act, a package of legislation meant to make access to treatment easier and cut off the flow of fentanyl from China. "Together we are going to end the scourge of drug addiction in America," Trump said Wednesday. "We are going to end it or we are going to at least make an extremely big dent in this terrible, terrible problem." This entry was posted in Issues and tagged Jeff Sessions, Opioids. Bookmark the permalink.